Valle d'Aosta (Italian: Valle d'Aosta (official) or Val d'Aosta (usual), French: Vallée d'Aoste (official) or Val d'Aoste (usual)) is a mountainous region in northwestern Italy. In English is common to call it Aosta Valley. The region has two official name: Regione Autonoma Valle d'Aosta (in Italian) and Région Autonome Vallée d'Aoste (in French). The capital is Aosta. 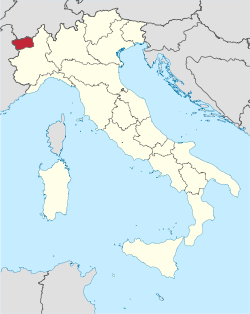 This is the smallest region in Italy with an area of 3,260.9 km2 (1,259.0 sq mi), and a population of about 126,883. It is the only Italian region which has no provinces. The regional government has taken all the administrative functions of a province. The region is divided into 74 comuni. It limits to the north with Switzerland (Canton Valais), to the west with France (region Auvergne-Rhône-Alpes), to the south and east with the Italian region of Piedmont. Mont Blanc; height: 4,810 m (15,781 ft) (45°50′01″N 6°51′54″E﻿ / ﻿45.83361°N 6.86500°E﻿ / 45.83361; 6.86500﻿ (Mont Blanc)), the highest mountain in the Alps. Monte Rosa; height: 4,634 m (15,203 ft) (45°56′12.6″N 7°52′01.4″E﻿ / ﻿45.936833°N 7.867056°E﻿ / 45.936833; 7.867056﻿ (Monte Rosa Massif)), the second highest mountain in the Alps. Gran Paradiso; height: 4,061 m (13,323 ft) (45°32′0″N 7°16′0″E﻿ / ﻿45.53333°N 7.26667°E﻿ / 45.53333; 7.26667﻿ (Gran Paradiso)). In the Valle d'Aosta, a region with many mountainous and close to borders with other countries, the mountain passes are very important. Even if now there some tunnels, they are important not only from a historical and geographical perspective, but also traditional and tourism. The Great St Bernard Pass (French: Col du Grand Saint-Bernard; Italian: Colle del Gran San Bernardo), between Valais, Switzerland and the Valle d'Aosta;. The southern part of the territory is occupied by the Gran Paradiso National Park, created in 1922 to protect plants and animals in danger of extinction. The valleys were made by glaciers moving at a time when the entire region was covered by them. Currently, glaciers occupy only the highest peaks. The Dora Baltea (French: Doire Baltée) river flows along the whole Valle d'Aosta, from the northwest to the southeast; it is 160 km (99 mi) long and is a tributary of the Po river. Map of Valle d'Aosta (in French). A person from the Valle d'Aosta is called a Valdotian (Italian: Valdostano/a, French: Valdôtain). The total population of Valle d'Aosta in 1 January 2017 was 126,883, of which 61,976 were male and 64,907 were female. Italian and French are the region's official languages and are used for the regional government's acts and laws, though Italian is much more widely spoken in everyday life. Of the population of the valley 96% speaks Italian as either a first or second language. Of the population 70% speaks French as either first or second language. School education is given equally in both Italian and French. The regional language is a dialect of Franco-Provençal called Valdôtain (locally, patois). It is spoken as native tongue and as second language by about 58% of the population, according to a poll taken by the Fondation Émile Chanoux in 2002. 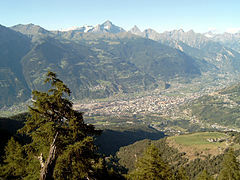 The residents of the villages of Gressoney-Saint-Jean, Gressoney-La-Trinité and Issime, in the Lys Valley, speak two dialects of Walser German origin called Titsch and Töitschu respectively. House in Cretaz, Valtournenche, Aosta Valley. ↑ 1.0 1.1 1.2 1.3 "Statistiche demografiche ISTAT" (in Italian). Demo.istat.it. Retrieved 3 October 2017. ↑ "Eurostat - Tables, Graphs and Maps Interface (TGM) table". Epp.eurostat.ec.europa.eu. Retrieved 7 June 2013. ↑ "Regione Valle d'Aosta /Vallée d'Aoste" (in Italian). Tuttitalia.it. Retrieved 3 October 2017. ↑ "Giants of the Alps". Valle d'Aosta official tourism website. 5 October 2012. Retrieved 7 June 2013. ↑ "Comunità montane" (in Italian). Regione Autonoma Valle d'Aosta - Sito Ufficiale. Retrieved 10 June 2013. ↑ 8.0 8.1 "Comuni valdostani per popolazione" (in Italian). Tuttitalia.it. Retrieved 3 October 2017. ↑ 9.0 9.1 "Statuto speciale per la Valle d'Aosta". La francophonie dans le monde (in French). 2013. Retrieved 11 June 2013. ↑ 10.0 10.1 "Val d'Aoste". La francophonie dans le monde (in French). 2013. Retrieved 11 June 2013. Wikimedia Commons has media related to Valle d'Aosta. This page was last changed on 9 May 2018, at 00:40.